I have again come to a point where I am at a loss of words. I am really finding it difficult to mince words. If someone were to come down and put words in my mouth, I would lovingly accept them and pen them. Sadly, no one is going to do that. Every writer who has been portrayed in movies, every artist at such a stage is shown to take support of Scotch. I’m planning the same tonight as well. I don’t know how much it is going to work but then I am going to try it. I am also planning to pick up one of my favourite book from the series that I have been following. The series written by Amish. The Immortals of Meluha and The Secret of the Nagas. The final book in this series is out already now and is waiting to be read. The Oath of the Vayuputras. I have come to expect a lot from the series after reading the first two books. I wonder what Amish has n store for me in his third and final book. How he manipulates the life of Shiva is fairly interesting read. Whatever you say, I have come to kind of like semi fictional, semi mythological stories. In fact I own a mini collection of that. All these books are classics in my own accord. Lamb by Christopher Moore, Yajnaseni by Dr Pratibha Ray, Krishna Key by Ashwin Sanghi and now finally the entire collection of the Shiva Trilogy. If I were to really look at the Godly figures these books were addressing, I have one on Jesus, one on Draupadi from Mahabharath, one on Vishnu and one set on Shiva. Yet, if I look back at my collection, I am missing so many Gods here! Indira, Brahma et al. I love reading my books in solitude with no disturbance. But then one thing that I would never want to set aside is my choice of Black Dog. That is the best company I can have with a classic book! How I wish I was of legal age to drink when I studied Shakespeare in school! I would have definitely enjoyed him a lot more! Even today, when I get a chance, I would definitely want to read a Shakespeare. But then again, I think I may have grown out of him now. One shot at school was good enough. 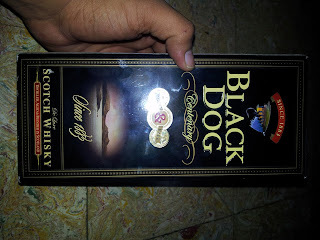 Talking about the classics, I have teamed Rabindranath Tagore and Black Dog. Let me tell you, it definitely is a wonderful combination. While the book grows on you, so does the Scotch. Neither wears away from your senses so soon. Tagore is known for his masterpieces and slowly building up the character. I think Black Dog took a page out of his writing. It so slowly grows on you that you would not want to let it go. Much like a lover wanting leave your arms and go home after spending a passionate evening of romance. So while I romance my books and Scotch, you go ahead and see if you can catch up on some beauty sleep. It’s Sunday night here. I am planning to live it up in style. What about you?